​“The passageway from almost total obscurity to a place in music history’s hall of fame opens to few composers. Samuel Felsted of Jamaica is certainly one who has traveled through that doorway in record time. Considering that absolutely nothing was known about the life of this composer until the late 1970s, his sudden rise to visibility is astounding”, wrote Dr. Thurston Dox in his article ‘Samuel Felsted’s Jonah – The Earliest American Oratorio’ (Choral Journal of the American Choral Directors Association, 1992). “There is no excitement quite like that of making a discovery which confounds all one’s preconceived notions, or opens up new areas of knowledge, about an aspect of history that had hitherto been obscure or neglected….”, are the sentiments of former Director of the Jamaica School of Music, Australian born Pamela O’Gorman, in her article ‘Jonah by Samuel Felsted, An Eighteenth Century Jamaican Oratorio’, (Jamaica Journal, Vol 22 No 4, November 1989 – January 1990). More than 25 years have passed since those profound words were expressed, and in that period one would hope that the oversight and neglect of the existence of Samuel Felsted and his works would have come to an end. However, aside from the activities of a handful of ‘Felsted – fanatics’ here in Jamaica, as well as some individuals in the USA, Great Britain and Germany, little has been done to let Jamaica and the world know about the great importance of the first complete oratorio written in the Americas, Samuel Felsted’s Jonah, which was published in 1775! It is with great pride that we share the following facts: the three major language groups in the Caribbean each have a representative in composition during the seventeen hundreds. Cuba’s Esteban Salas (1725 - 1803) has been well researched over decades and the major bulk of his works, which have been archived in the Cathedral of Santiago de Cuba, have been published. His music is well known and regularly performed throughout Cuba and Latin America, and many of his compositions are recorded, especially many of those wonderful ‘Villancicos’. It is said that the existence and works of the flamboyant Joseph Boulogne, Le Chevalier de Saint-Georges, born on December 25, 1739?, or 1745? in Guadeloupe, and who died in Paris on June 10, 1799, may have been left out of the music history books for centuries on purpose. However, this secret was too astounding to be kept hidden, and over the past decades many books have been written on his life, and many of his works recorded; his life story has also been put to film on several occasions. In our humble view, Joseph Boulogne was one of the notable men who linked the Caribbean to Europe, musically speaking. His fame, not only as one of the best fencers of his time, but as composer, conductor and virtuoso on the violin, was so widespread that Mozart’s Father Leopold wrote a letter of recommendation for his son Wolfgang Amadeus in 1778. Mozart, traveling with his mother to Paris, was to deliver the letter which contained Leopold’s request: would Joseph Boulogne Le Chevalier de Saint-Georges kindly consider performing some of Mozart’s new compositions? We here in Jamaica owe it to the legacy of Samuel Felsted to continue spreading the knowledge of his existence and achievements, fanning the flame that was lit by the Founder of the American Music Research Centre, Sister Mary Dominc Ray in 1969. In her article ‘Six Tales That Wagged a Seventh’, (Sonnek Society Newsletter 9, Spring 1983) Sister Mary Dominic Ray, Founder of the American Research Centre, excitedly details her discovery of a forgotten Jamaican historic treasure, and her unforgettable experiences with Thurston Dox following her discovery. Along with Dr. Dox, Sister Mary Dominic set off on an adventure to breathe new life into Felsted’s music, an adventure that was to lead to enthralling experiences. The first tale began wagging when I first stumbled onto a footnote on page 284 of Oscar Sonneck’s EARLY CONCERT LIFE IN AMERICA (DaCapo, 1969) [sic] which lured my curiosity to the top of the page. Of course I soon discovered that there was an oratorio (JONAH) ‘dispos’d for voices and harps’ by an obscure composer (Samuel Felsted), and that a copy lay in the British Library (Museum). Like a bolt out of the blue I told myself ‘Send for that for the American Music Research Center (AMRC) AS FAST AS YOU CAN!’ And so it was that in a few weeks’ time a microfilm copy arrived and I saw the music for the first time. A conscientious perusal of it assured me that this was nothing mediocre; rather it certainly appeared to be something very interesting, even enticing. With that observation I put it on ‘ice’ in one of the locked cabinets, there to reside till I might get it performed - but just how, when or where, I knew not”. 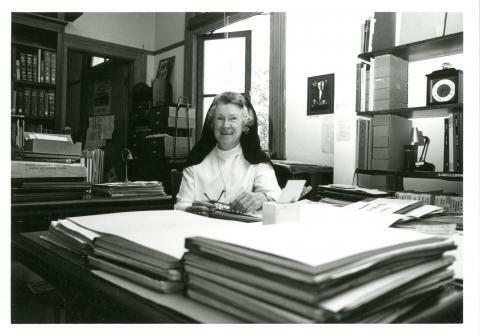 Sister Mary Dominic Ray coordinated a simultaneous revival performance of the oratorio Jonah on the East and West Coast of the United States of America, which took place on October 26, 1980. Dr Thurston Dox was the conductor of the East Coast concert and Dr Wilbur Russell, another Sonnek Society member, led the one on the West Coast. It so happened, that at Dr. Russell’s West Coast performance, several Taiwanese friends of his were present, and they invited him to conduct Samuel Felsted’s Jonah in a two month tour of nine cities in Taiwan in August and September of 1981, in a version translated into Chinese! After the discovery in the 1970’s of Samuel Felsted’s oratorio Jonah and the Six Organ Voluntaries by Sister Mary Dominic Ray, and in conjunction with his own research in the field of American oratorios and cantatas, Dr. Thurston Dox embarked on what had become an all absorbing life’s work and a vibrant association with the Island of Jamaica. Dr. Dox was led on the most memorable of research trails. From the British Library (which has held a copy of the original 1775 printed score in repository for over 200 years!) he was directed in 1979 to Mr. Kenneth Ingram, bibliographer and former librarian of the University of the West Indies. In turn, Mr. Ingram directed Dr. Dox to the National Library of Jamaica where a close relationship was established through correspondence, telephone calls and many personal visits over the next several years. Further invaluable information was obtained from the Jamaica Archives but not without exhausting hours of his personal scrutiny of a myriad of documents. Dr. Dox’s indomitable enthusiasm joined with his painstaking research into primary source material and the method with which he sifted and analyzed each new item of information became legend with the staff at both the Jamaica Archives and the National Library of Jamaica. In 1988, the American Music Research Center awarded Dr. Dox a substantial grant that permitted him to undertake further research into the life of Samuel Felsted. He has uncovered an invaluable amount of information about Felsted’s life through his relentless research, and is credited with revealing one of the most important facts about Felsted- that he was Jamaican, born and raised. In her first article ‘Jonah By Samuel Felsted’ in the Jamaica Journal in 1989, Pamela O’Gorman, then director of the Jamaica School of Music, speaks about the excitement she felt on the day when Mrs Valerie Facey handed her a photocopy of the score which accompanied a recorded performance of an oratorio entitled Jonah composed by Samuel Felsted, Organist of St Andrew Parish Church, Kingston and published in 1775. She further states that even more exiting – and a little startling - was the statement by the conductor Dr Thurston Dox, that current researches in the area of American Oratorio history leave little doubt, that Felsted’s oratorio Jonah is the first complete work of its kind to have been performed – and probably composed – in the New World’. This was the direct contradiction of the popular assertion that nothing of any artistic value, musically, came out of this ‘trading post’ during the colonial era. During a trip to London, Pamela O’Gorman spent a day at the British Library searching for the score of Jonah and to her surprise she encountered the Felsted oratorio in the Published Music Section. According to her account within minutes the score was recovered from the mysterious labyrinths of the storage area and delivered to the Music Reading Room. To further quote her: ‘There is a strange awe which accompanies the reading and handling of an original score some two hundred and ten years old’. She then immediately arranged to have the score photocopied and sent to Jamaica. This copy is now deposited in the National Library. About three months after her visit to the British Library, she received an urgent message again from Valerie Facey to say that Thurston Dox was in Jamaica and ready to meet her at the Oceana Hotel. She agreed, and found Dr. Dox in a state of high excitement; for that day, after just four hours of searching through certain records in the Spanish Town Archives, he had discovered that Felsted’s parents were actually living in Jamaica at the time of his birth in 1743 – thus establishing what had hitherto been in doubt, that Samuel Felsted was Jamaican born. Henceforth he would be indentified as a Jamaican composer. According to Thurston Dox’s article ‘Samuel Felsted of Jamaica’, published in 1991, in Volume 1 of the American Music Research Center Journal Dr. Dox states that ‘Samuel Felsted’s presence on the island is recorded as early as 1762 in a deed which shows him as a property owner at age nineteen. A baptismal record dated 1763 informs us, that he was baptized as an Anabaptist at age 20, making his birth year 1743. His parents were doubtless the William and Joyce Felsted (born Weaver) whose marriage took place in 1741 in Philadelphia. William Felsted was an ironmonger, a hardware merchant, who apparently had come to Jamaica in the 1730s and made his way to Boston, setting up a business there in 1737. While Joyce’s family background remains obscure, she and William may have met in Boston. On returning to Jamaica they stopped in Philadelphia for the purpose of being married in the famous Christ Church there. A bill paid to William Felsted for goods purchased from him by the Vestry of Kingston, Jamaica, in 1742 is evidence that the Felsteds resided in Jamaica shortly after their marriage and leads to the all-important conclusion that Samuel Felsted must have been born there the following year. William, the father, was also a musician. Several musical instruments are mentioned in inventory found in his will. He served as organist for Andrew’s n the 1760s. The question of Samuel Felsted’s education and his musical study is particular a critical one. Two school existed on the island which he might have attended during his boyhood years. The most likely would have been Wolmer’s School in Kingston, where he lived – established in 1743 through the will of John Wolmer and still providing education today for the children of Kingston . The second possibility is a school known as Old Woman’s Savannah, located some fifty miles from Kingston in the Parish of Clarendon, which was the only school in Jamaica at that time that accepted students from other parishes. His musical education was probably administered during his formative years by his father and later probably by the venerable Daniel DeLuskie, who served as organist of the Kingston Parish Church for a period of forty-one years. The most convincing bit of information regarding the circumstances of Fested’s early education comes directly from an unexpected source. In 1771 Samuel Felsted was admitted to the newly- formed American Philosophical Society in Philadelphia, to which Benjamin Franklin and other notable intellectuals of the day belonged. Felsted became one of four eighteenth-century Jamaicans to be received by this prestigious institution. Dr. James Smith, a judge of the Court of Common Pleas in Kingston and author of the letter of support for membership mentioned that “His education has been rather confined, but by great industry and force of native genius, he has recommended himself to the wise and learned of this island”. Dr. Smith, in his sponsorship letter wrote: “Mr Samuel Felsted, an ingenious young Gentleman of good reputation in this Town applied to me for an introduction to the members of your newly established Society, expressing a great desire to become a correspondent; being long convinced of his merit in the three Sister Sciences, Poetry, Painting and Music for which he has natural genius”. In further testimony to his scholarly interests, Felsted forwarded specimens of native Jamaican butterflies and designs for a horizontal windmill to the Society as evidence of his activities as a botanist and an inventor. (The purpose of the horizontal windmill was to power sugar mills in Jamaica, sugar being the primary crop produced on the island in that period). In the same year in which he applied, Felsted was admitted to the reputable institution. Regarding his trilogy of talent in the arts, it is reasonable to assume that he was the poet-librettist for Jonah and was indeed a painter. The Institute of Jamaica documents that a painting of a Kingston residence by S. Felsted, dated 1778, was offered for sale to the Institute in 1947 by a London Art Dealer. Felsted was no stranger in England. Two of the subscribers of the first engraving of his oratorio Jonah to be published in 1775 by Longman, Lukey and Broderip in London, were the famous British-American painter, Benjamin West and the engraver Francesco Bartolozzi, both of whom served the British crown during their careers. West painted the picture of Jonah used for the cover of the score and Bartolozzi made the engraving. Connections such as these in the cultural milieu of Felsted’s world must be acknowledged as highly significant (end of quote). According to Pamela O”Gormans first Jamaica Journal article ‘the printing of music was an expensive undertaking in the eighteenth century, even though the earlier process of hand engraving had been ‘mechanized’ by use of punches – long tools having a note or other character at one end – which were struck by a hammer. The publication of Felsted’s score was financed through the efforts of a large number of people – 243 to be exact – who paid subscriptions by ordering copies in advance: eloquent testimony to the esteem in which he must have been held in the island at that time’. The list boasts notable public figures, such as Sir Basil Keith, then Governor of Jamaica, and persons from a wide range of professional capacities, such as British military officers, members of the Jamaican Assembly, court judges, attorneys, merchants and organists. Pamela O’Gorman also mentions ‘that it was unusually fascinating the number of Jews who subscribed – notwithstanding the fact that Oratorio was a Christian art form and Felsted was organist at one of the leading Anglican churches in Kingston. Perhaps the fact that the subject was drawn from the Old Testament was a mitigating factor (end of quote). In the eighteenth century tradition of dedicating compositions to aristocrats and dignitaries, Felsted dedicated Jonah to Mrs. John Dalling, at that time the wife of the Lieutenant Governor, whom Felsted admired for her own musical abilities. In the dedication Felsted refers to “this little piece, which is submitted to the candor of its judges as my first attempt at composition”. Upon hearing this “little piece” it is very hard to believe, that it was really his first attempt to compose. Because of its quality and the composer’s obvious talent, one assumes that Felsted continued to write music, perhaps lost to the violence of earthquake, hurricane and fire so common in Jamaica. Only one other work by Samuel Felsted has survived: Six Voluntarys for the Organ or Harpsichord, a set that was written and published following his enrolment as organist at the Kingston Parish Church in 1783. A published score is in the archives of the Bristol Public Library in England, originating from the private collection of an acclaimed British organist. These Voluntarys and Jonah are Felsted’s only known works. Jonah is a mixture of styles to some degree. However, it still falls directly in the category of oratorio, by virtue of the fact that it is a (unstaged) dramatic work based on a biblical story that was to be performed by chorus, soloists and instrumentalists. The single-unit structure of Jonah, with its many recitatives (songs sung in the rhythm of ordinary speech with many words in a note) and few choruses, bears striking resemblance to Handel’s much earlier works. Several aspects of Jonah confirm it to be a piece for church worship. First, in comparison with other Baroque and Classical oratorios, Jonah is a short one, only 40 minutes long. Second, other than the narrator, only two roles are provided for soloists and there is no dramatic dialogue between them. Third and finally, it is written for keyboard accompaniment. These factors show that Jonah was not meant for concert entertainment. The limited use of chorus and the positioning of choruses at the end is reminiscent of eighteenth-century Italian oratorios. The numerous recitatives are Baroque in style, and suggest some Handelian influence. Underlying the entire score is Felsted’s genius use of figured bass. According to Dox, the earliest recorded hearing of Jonah was in Jamaica in 1779. Knowledge of the oratorio spread like wildfire to other colonies, where it was especially popular among performing groups. In North America, the earliest known performance was in 1788, with two subsequent performances in New York on June 18, 1789 and December 9, 1802. A performance scheduled to take place in October 1789 in Boston (a vibrant centre of artistic life in America at the time) was postponed until later in the month to accommodate the presence of George Washington, who had just been elected President of the United States of America. Unfortunately, because of an epidemic of influenza, which resulted in the ‘disposition of several singers’, the performance of Jonah did not take place. The oratorio was not performed until December 2, - unfortunately without the presence of the president. On October 26, 1980, just a little more than 200 years after the first recorded performance of Jonah in Jamaica in 1779, the simultaneous revival performance of Felsted’s Jonah on the East Coast and West coast of the United States took place thanks to Sister May Dominic Ray’s inquisitive mind and enthusiasm. After great efforts of fundraising by Dr. Dox, Jonah was performed again and recorded for the first time, in 1983, at the First Presbyterian Church, Oneonta New York, through the efforts of the American Music Research Center and the Catskill Choral Society (Musical Heritage Society, MHS Stereo 4870L). In addition, the work was also presented at Union Theological Seminary in New York in 1983. Dr Thurston Dox recalls that the recognition of Felsted’s oratorio Jonah as being the first work of its kind in the New World has gained attention of several noted members of the Jamaican musical community, among them Valerie Facey, publisher and leader in cultural and historical pursuits, and Pamela O’Gorman, as well as the Reverend (now Bishop) Robert Thompson, and Paul Bicknell, the organist of the St. Andrew Parish Church. They together with a number of likeminded individuals, Kingston area musicians and the local press arranged a performance of Jonah in the sanctuary of St. Andrew Parish Church, on November 26, 1990. According to Thurston Dox’s account, he and his wife were present at the concert, along with seven hundred patrons, including academic and governmental dignitaries and representatives from foreign embassies. The event was momentous, a triumphant return of the work to its place of origin after earlier performances and a recording in the United States. Emerging from two hundred years of obscurity, the Jamaican composer Samuel Felsted can now take his place among other eighteenth-century composers who struggled to create a musical culture in the New World. Another special performance of Jonah took place on October 6, 2000, for the ‘Hallelujah Gala’, a German-Jamaican Choir Concert, sponsored by the German Embassy of Kingston, which was repeated at three venues across the island. Our Music Unites Jamaica Foundation (formerly known as RCM Music Foundation) invited the ‘Motettenchor Speyer’ of Germany, conducted by Marie Theres Brand, together with Jamaican counter-tenor Curtis McDonald and Trinidadian Tenor Edward Cumberbatch to perform Jonah accompanied by a chamber orchestra and organ. Renowned specialist in the interpretation of Baroque Music, Professor Manfredo Zimmerman of Argentinean/German origins, orchestrated Jonah especially for these performances. As a positive outcome of our collaboration, it is anticipated that by January 2017 the orchestrated version of Samuel Felsted’s oratorio Jonah will be available for the first time ever for purchase online, together with the Six Organ Voluntarys. In the year 2001 the ‘Motettenchor Speyer’ of Germany, and their musical director Marie Theres Brand, invited the soloists of the ‘Hallelujah Gala 2000’, to participate in a performance of Jonah at the St. Joseph’s Church in Speyer. This concert was recorded live and is available in the form of a CD (Cavalli Records, CCD 416). Bryan Jones, American specialist in the performance and practice of Baroque music and founder of the ‘Felsted Project’ has during the last decade presented Felsted’s oratorio on period instruments, at all historical locations of Jonah performances of the seventeen and eighteen hundreds, on America’s East coast. Initiated by our Foundation, excerpts of the oratorio Jonah were performed commemorating the bicentenary anniversary of Felsted’s death in 2002 at the Kingston Parish Church, where Samuel Felsted held the post as organist until his passing on March 29, 1802. Jamaican dub- poet Yasus Afari wrote the poem ‘Samuel’ especially for this celebration. In this poem Yasus elaborates on the mystery of knowing only Samuel Felsted’s name. Hoping the vision of what is to be.